As a Creative Cloud member, you can convert trial installations of most Creative Suite 6 (CS6) applications so that you subscribe to them as part of your membership. 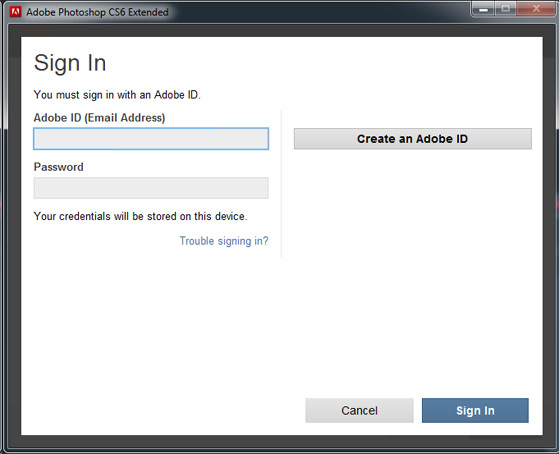 You can also convert a CS6 application you've installed with a serial number to a Creative Cloud membership. Want to convert trial versions of Acrobat, Flash Builder, Lightroom, or Muse? See Convert Acrobat X, Flash Builder 4.7, Lightroom, or Muse. Sign in with your Adobe ID (your email address) and password. Use the same Adobe ID that you used to join Creative Cloud. Don't know your Adobe ID or forgot your password? See Adobe ID | Sign in | Change email, password, or account information. For CC 2014 applications, your membership will be activated the next time that you launch the application. You cannot convert trial versions of these applications to a Creative Cloud membership. You can, however, install these applications using the Creative Cloud Desktop application. For instructions, see Install and update apps. Have an earlier version of Acrobat, Flash Builder, Lightroom, or Muse? The Creative Cloud Desktop application doesn't recognize earlier installations of these applications. If you have a trial version of one of these applications, first uninstall the application and then use the Creative Cloud Desktop application to reinstall it. For instructions, see Install and update apps. Before you can convert an application you've installed with a serial number to a Creative Cloud membership, deactivate the application. Choose Help > Deactivate, and follow the onscreen prompts to deactivate the application. Quit and restart the application. Internet connection, firewall, or certificate errors? These errors indicate that the application is unable to establish a connection with Adobe's activation servers. 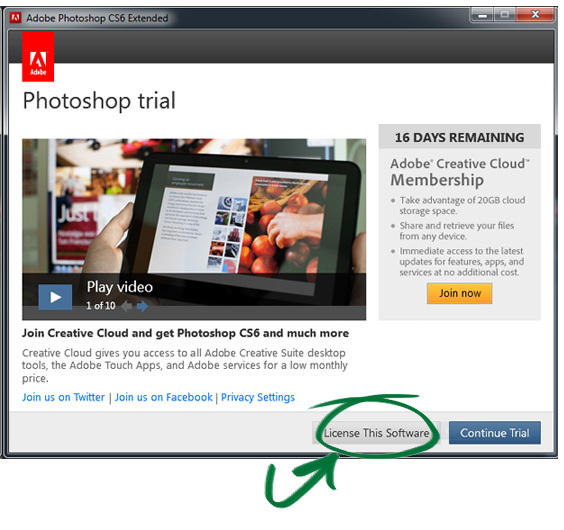 See Sign in, activation, or connection errors | CC, CS6, CS5.5. Does your non-English language application start in trial mode? This issue occurs if you purchased an English language Creative Cloud membership, but the Creative Cloud Desktop application is set to a different language. See Creative Cloud products launch in trial mode on non-English operating systems | CCM, CS6. Prompted for a serial number? Are you prompted to enter a serial number when you start a CS6 application that you've converted to a Creative Cloud membership? See Creative Cloud applications ask for serial number. Creative Cloud application unexpectedly reverts to trial mode? Do you see a message stating that you are running a trial version when you open an application that is part your Creative Cloud membership? See Creative Cloud applications unexpectedly revert to trial mode.